5 August 2017 Jodie Carey’s sculptural installation Stand consists of 50 slender uprights, roughly cast in plaster from pieces of old timber, mounted on steel plinths and arranged in a way that, on first view, suggests a forest glade. The casts were made in earth so that impurities, stones and pieces of soil are collected on each of the forms. The gnarled surface of each is white and darkened like the trunk of a tree, and picked out with delicate touches of colour. These flecks are like reflected light, as if a stand of birches was illuminated by coloured glass windows, creating an impression of something both natural and sacred, while also suggesting a ruin. Earthcasting – making a mould by pressing an object into the ground and then pouring in plaster – is just about the most primitive method of casting, and one that Carey has made her own. The roughness of the method is part of the way it generates form with none of the precision or control of casting with pre-formed moulds. It is also difficult to escape the symbolism of burying an object in earth and the feeling that some sort of ritual of regeneration is being enacted. The old pieces of timber, I learned, had been reclaimed from the Victoria & Albert Museum, where they had been used for many years to construct the splints – storage structures for plaster casts located above the famous cast court. Stand is Carey’s most recent exploration of the potential of cast and carved plaster to create forms rich in their signification of the natural world – and of human rituals, particularly those associated with death and memorialization. Sacral, ritual associations are never far away in her work. The large, untitled, carved-plaster objects the artist made in 2015 bring to mind burial urns and the age-old ritual of interring bodies whole – the Hydriotaphia, or Urne Buriallfamously documented by Thomas Browne in 1658, following the discovery of Roman funerary vessels in Norfolk. Shroud-like canvases painted chalky white surrounded Carey’s urns when exhibited in London two years ago, as they do the uprights of Stand, bringing to mind the place of textiles in burial rituals, both for wrapping bodies and as part of the costly equipment of grave goods. 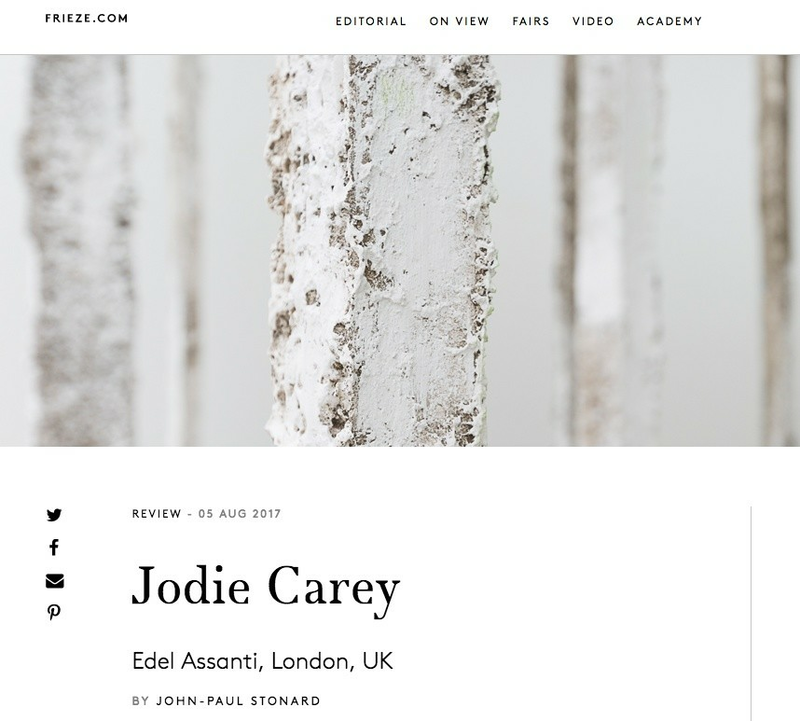 Jodie Carey, 2017, Edel Assanti. Courtesy: Will Amlot and Edel Assanti, London. Despite these sepulchral associations, Carey’s sculptural imagination is neither sombre nor morbid – quite the opposite. Her ‘Untitled (Slabs)’ series from 2012 – large upright forms faced with plaster on one side, revealing their wood and hessian framework on the other – might seem like memorial stele, but are delicately and disarmingly toned with colouring pencils. For Shroud, an installation in the Anatomical Theatre of Berlin’s Humboldt University, Carey covered the floor of the space with a fine white powder made from grinding animal bones. Rather than freighted ideas of memorialization or sombre death rituals, the recurrent feeling in her work is one of release, of levity, of a quietly elegant compensation for trauma and loss. Stand is no less invested with this spirit of remembrance and an equally wide range of imaginative associations. Each upright has a definite face, so that standing around human-height they appear as substitute figures, abstract effigies, giving the piece an inhabited feel. Not only a monument to natural ruin and regeneration, then, but also to the power of organized confrontation – of making a stand. Jodie Carey, ‘Earthcasts’ runs at Edel Assanti, London, until 8 September. John-Paul Stonard edited and cotributed to The Books that Shaped Art History (Thames & Hudson, 2013) and co-curated 'Kenneth Clark: Looking for Civilisation' at Tate Britain, London, UK, in 2014. He is currently writing a book about the story of art for Bloomsbury UK.